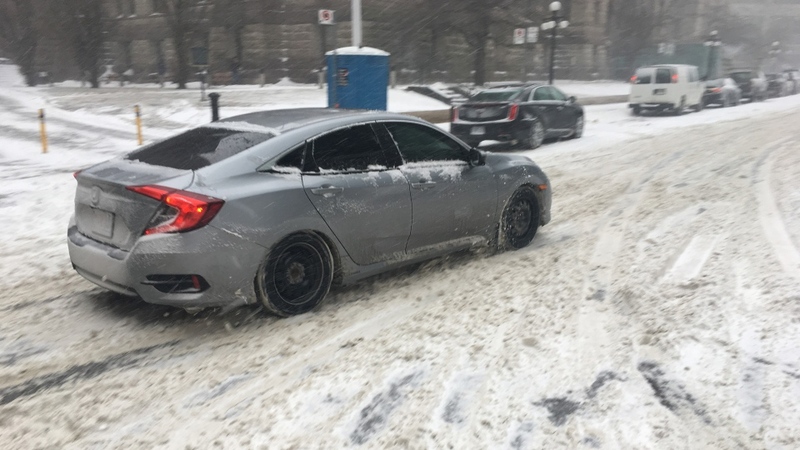 Those getting around Toronto on Tuesday were in for a messy commute as a blustery winter storm whipped snow, ice pellets and freezing rain across the region. The snow started falling by around 7 a.m. and continued steadily into the afternoon and evening. 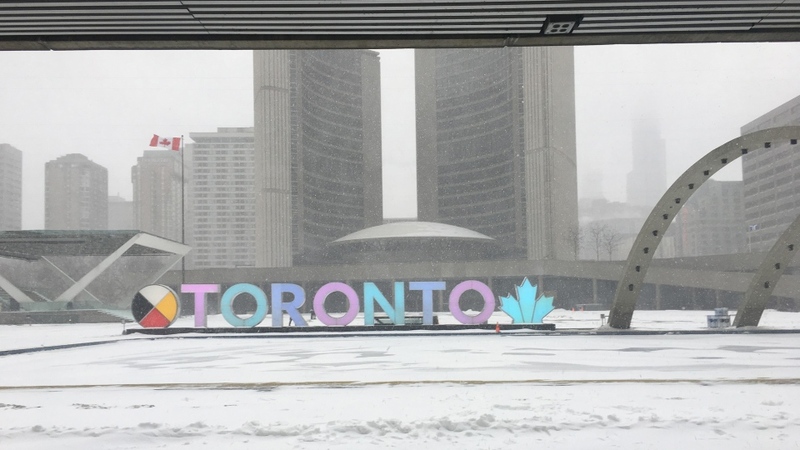 Toronto and most of southern Ontario remain under a winter storm warning from Environment Canada as the Colorado low moves across the province. “Snow at times heavy continues over the region. Strong easterly winds gusting near 70 km/h will result in sudden and significantly reduced visibility due to blowing snow,” the agency said in its warning. Stronger wind gusts near 80 kilometer per hour are also possible near the shores of Lake Ontario, according to the statement. Visibility did improve in the afternoon Tuesday as the precipitation changed to a mix of snow and ice pellets. There was also a risk of freezing rain later in the afternoon, Environment Canada said. “This’ll be another day of extreme patience. 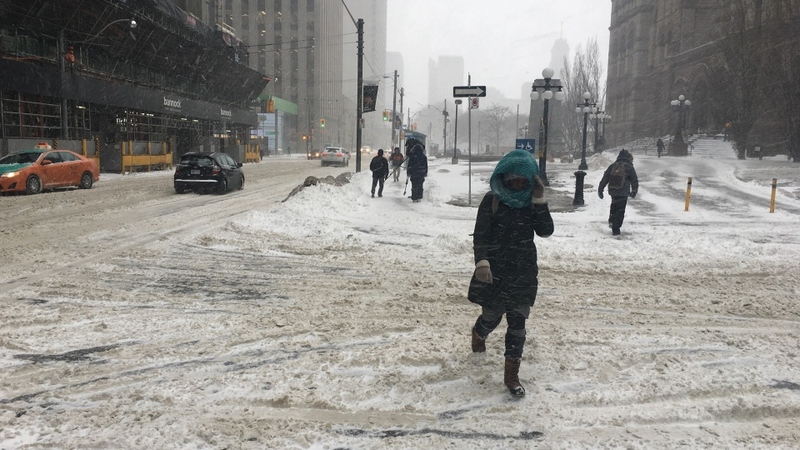 If you don’t need to go out today or drive today, it probably isn’t a bad idea,” Mark Mills, superintendent of road operations for the city, told CP24. An extreme cold weather alert also remains in effect for the City of Toronto. While a high of 0 C was expected Tuesday, the wind chill was expected to make it feel as cold as -15. This evening, ice pellets were expected to change to drizzle mixed with freezing drizzle and then to snow later in the evening. Toronto Hydro said thousands of customers were left without power in the evening hours of the storm on Tuesday. As of 11 p.m., about 2,000 customers were left without power in Mimico, about 2,800 near The Beach and about 8,000 near the Stockyards District. "Crews are facing extremely challenging conditions and we ask for customer's patience this evening as we continue to respond to weather-related outages," Toronto Hydro said on Twitter. 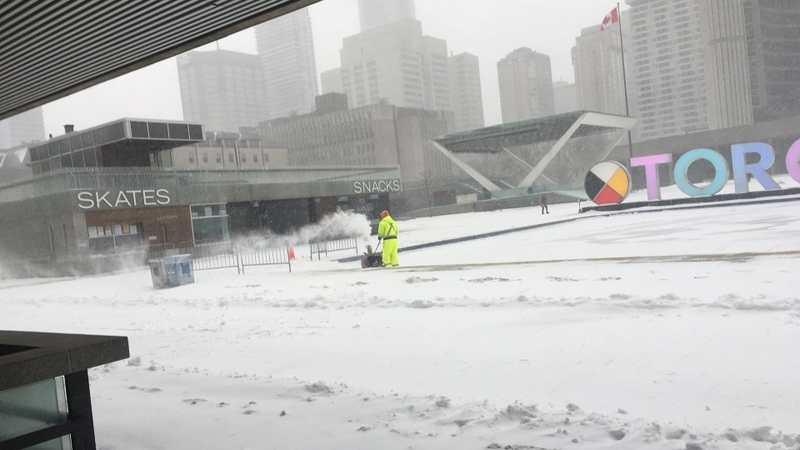 The City of Toronto said Tuesday afternoon that all non-essential services shut down at 2 p.m. to allow staff to get home in a timely fashion. “Non-essential City services will close at 2 p.m. to ensue employees get home safely and in a timely way. Plowing and salting of roads, sidewalks and cycle routes continues apace,” city spokesperson Brad Ross said on Twitter. The Ontario Science Centre also announced that it would be closed for the day. Many places around the city, normally bustling on a weekday, were unusually quiet as many people heeded warnings about difficult commutes and decided to work from home and avoid travel. The TTC and Metrolinx advised commuters that service could be slower today, but said they were adding extra trains and staff to try and make sure that transit services don’t freeze up because of the storm. The messy storm meant thousands of kids in Toronto and other parts of the GTA got a rare snow day. The Toronto District School Board, the Toronto Catholic District School Board and a number of other boards closed all schools for the day. This is just the third time in 20 years that the TDSB has closed all of its schools for a snow day, the last being in 2011. Speaking with CP24 Tuesday morning, TDSB spokesperson Ryan Bird said the school board, based on the forecast, decided not to take any chances with the expected storm. He said that while the move will inconvenience many families, the board made the decision based on safety concerns. “We recognize that when we close our schools, it impacts thousands of families across this city, including some that may not have a lot of options when it comes to childcare when schools are closed. That’s why we take this decision so seriously,” Bird said. Public and Catholic schools were also closed in Peel and Halton regions, as well as Hamilton and a number of other areas. Schools remained open in York and Durham regions, though school buses were cancelled in those areas. In addition to the school closures in Toronto, the city said that indoor recreation and aquatic programs at all facilities were cancelled as of noon. However community centres remained open for permits. The storm is also making travel tricky for air passengers. Pearson International Airport reported Tuesday morning that roughly 30 per cent of all arriving and departing flights have already been cancelled. OCAD University - all classes and activities cancelled today. All Georgian College campuses are closed today (Feb. 12) and classes are cancelled.